3 1/2 stars. 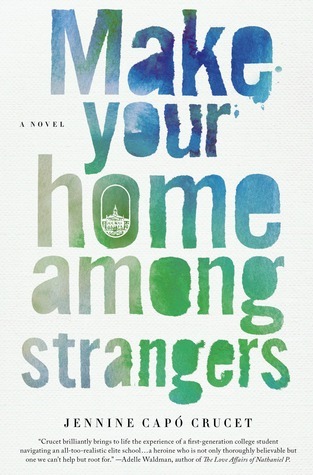 Make your Home Amongst Strangers has the makings of a really good book, and it was good but some aspects didn't quite work for me. As a first novel though, it is very strong and I will definitely look for the author's book of short stories and next novels. The story takes place in 1999 and 2000. Lizet was born in Miami to parents who immigrated to the U.S. from Cuba when they were teenagers. Lizet's world is the Cuban community in Miami until she is accepted at a fictional Ivy League school in New York State. From then on, she experiences the challenge of not belonging anywhere. She is ill equipped to understand the Ivy League world she has entered -- a world that is quick to pigeon hole her as a minority student and that she too often misreads. At home, no one except her father who is estranged from the family, has any understanding or respect or interest in the route she had chosen. In the background, her mother is developing a public persona as part of the campaign to keep Ariel Hernandez -- the Cuban boy whose mother died on a raft from Cuba to Miami -- which irks Lizet and distances her from her mother further. The story is told in the first person from Lizet's point of view. One of the strengths of the book is that Lizet is far from perfect and her reactions and impulses often do nothing to help her circumstances -- many times I wanted to give her a shake. This is a strength because it feels more real and certainly is a more realistic picture of the challenges involved in bridging such broad cultural and economic divides. It was also a really interesting glimpse into the Cuban American community --which I recognize is not unidimensional. Unlike many Americans, because I am Canadian I have had an opportunity to travel to Cuba many times, generally as a tourist but sometimes for work. As a consequence, I don't have a sense of polarized negativity toward Cuba that comes through in this book -- although I don't have rose coloured glasses either I can assure you. So it was interesting to see Cuba from Lizet and her family's perspective. The weaknesses for me are probably typical of a first novel -- at times is felt long and a bit meandering. And I found the subplot involving Lizet's mother's involvement with Ariel's story didn't quite work for me -- her mother never jelled as a real person. Certainly, it was still worth the read -- especially to see Lizet struggle between her two worlds. And the political undercurrent is important -- the author makes a real dig at the poverty -- in both senses of the word -- of the public school system Lizet comes from in Miami and how elite universities need to step up their game to create a more hospitable environment for students who don't come from privileged backgrounds. Thank you to Netgalley and the publisher for an opportunity to read an advance copy. Compulsively Readable ....A universal tale..... going off to College...beingclassified as a minority student ... And all the trials and tribulation that come along with it. Liset is from Miami ... Parents are cuban immigrants ... having recently divorced ... Older sister Leidy, is living at home with her mother in a small apt. ( with her new baby, Dante, as a single mom)The father left his wife at the same time Liset leaves for her Freshman year to Rawling's University in New York. Liset leaves behind her a mother, sister, nephew, whom are crowded together --scraping by financially. With loans, grants, and a work study program at the college in New York.. everything is foreign to Liset ( including the whether, she is never seen snow). Even before the First Thanksgiving break back home, ... Liset is petrified she is going to be asked to leave the University. She is failing chemistry-- and she was accused of plagiarism. NO Spoilers! :) Readers will be turning pages to see what happens. During her first break home... ( hoping to find a way to tell her mother and sister her troubles atSchool - she gets upstaged with the news of Ariel Hernandez... ( the young 6 year old boy who is from Cuba, who entered our country unassisted. He's mother wanting him to have the American opportunities -- and his father who is still back in Cuba asking the UN for their help to get him back home. With so much commotion going on, and her mother glued to the TV, Liset never tells her family of her school problems. Back on the college campus -- Liset's roommate and other students want to talk about Ariel. Liset ( even though born in America), is often introduced as 'the Cuban Girl'. Many assumptions are made about her.. ( she's from the ghetto, she's prejudice and racist), and on top of her social challenges... she has bigger Academic concerns. She doesn't feel she can express freely her thoughts about Ariel Hernandez. It seem all over the country Ariel Hernandez is in the news. Protests for the child to stay in this Country - protests for him to be deported. Being a Latino... ( only 3% enrolled in the school), is added pressure for Liset on the college campus. She is getting the type of attention she doesn't want. Can't she just focus on her school work? Why is it so difficult to ignore political, social, family, concerns at a time in her lifewhen she herself needs academic support and emotional encouragement? "It was only a coincidence that I knew and cared about the protest, not a consequence of being Cuban, and so I denied caring at all." Anything can happen with a person's college Journey.Do you remember yours? What choices worked? Or didn't work? I wasn't a minority student... but I did have to pay for college myself... ( challenging years on many levels) Even in the best of conditions -- college years can be very trying for many...Liset's story will grab you from the start... You want to know everything that happens..........She is so easy to love. Jeanine Capo Crucet is a wonderfully descriptive writer who has the ability to write beautiful and flowing prose and make the reader feel as if they are witnessing and experiencing a scene rather than just reading about it. Thank You to St. Martin publishing company, Netgalley, and Jennine Capo Crucet!!! 3.5 Lizet, youngest daughter of Cuban parents, is accepted as a scholarship student at a prestigious college. Her parents marriage breaks up, her dad moving out at the same time Lizet leaves Miami to go east to school.Lizet is an interesting character that we will see change and grow throughout this story. The first in her family to go to college she has a rough road to tow. She doesn't feel that she fits into her college's environment, misses her familiar life back at home. That however, is changing to as her mom become involved in the situation of young Ariel Gonzalez, the little boy rescued and brought into this country, but whom the government is attempting to send home. Also, her sister thinks that now Lizet feels she is so smart and better than they are, that she looks down on them.The story stalls in a few places but it does a great job showing the plight of the immigrant. The first to go to college in a family and how they have trouble fitting into a new life but finding they no longer fit into the old. The comparison in the story with Ariel's plight and Lizets attempt to find her place is well told. Lizet must find her way forward while retaining her relationship with her family. Good storytelling and an interesting concept.ARC from NetGalley. This book was fine, not what I expected based on the description, and got tiresome as it progressed. I'm a little suspicious when newer, younger authors (especially those who look suspiciously like their main characters) write a book centered on leaving home and going off to college. It makes me wonder if perhaps they haven't had enough life experiences to write about other topics, and this book in particular screams of a tweaked memoir passed off as fiction. To me, there were several glaring problems. First, there's supposed to be this big huge independence vs. family dichotomy, which would be great, except Lizet's family doesn't seem all that loving or capable of a single emotionally intelligent thought. They are all mean-spirited, callous, petty, and unable to think past the present moment. None are likable, and as a reader I experienced no internal tug whatsoever toward the possibility that Lizet should spend more time with them. The only one who stood out as mildly reasonable was Omar, and even he was strangely unable to grasp why a college education might be important. Second, I'm not at all convinced that Lizet IS smart or capable enough to go to Rawlings, a fact that the story relies upon. She sounds like someone who would benefit GREATLY by going to community college before attending a college or university, learning how to properly cite her work, how to handle herself in an academic setting, study habits, etc. and then doing much better in that college once she transfers. Third, I don't believe that the "typical white person" opinion of Ariel/Elian Gonzalez was depicted correctly. I was nine during that event and lived in a typical, largely conservative suburb and listened to teachers and friends' parents talk about this political issue. NONE of them thought that Elian should be sent back to Cuba. Their opinion was that America is the most glorious country of freedom, liberty, and justice, under God, undivided, for all, and we must save this godless communist soul that has washed up on our shores of liberty. I typically enjoy rambling family dramas, but the problem with this novel is that in order to build up a book around unlikeable characters, the characters have to be nuanced and interesting. These characters were not. I didn't understand Lizet's dad's motivations or actions, nor did I find her mom sympathetic in any way. Lizet was fine to me, maybe only because I was also a very stupid new college admit who thought moving out of my parents' home was a big huge deal, and I also made frustratingly stupid mistakes that could have easily been prevented. This book was fine, I made it through and even looked forward to reading it, but it didn't impress me, and I can't think of anyone I would recommend this to. I've often wondered about the experiences of minorities at Ivy League colleges, and this novel explores this with some real depth. The characters are very accessible and it's wonderfully written. Jennine tackles a subject I've always been curious about, but have never seen represented in fiction: the experience of being a minoritiy in a very white space. Liz secretly applies to an elite college, and leaves Miami to attend, which creates a fall out back in Miami. At college, Liz suddenly feels like a minority, something she never really felt in Miami, and she has a difficult time adjusting. She also ties in the news story of Ariel Hernandez, the little boy who arrives on the shores of Miami illegally on a raft from Cuba, and a court case ensues, ultimately ending with the father taking him back to Cuba. It embroils the family and fills the story with tension as Lizet has to decide whether to put her needs first or her family's. One of the most boring books I have ever read. I did actually finish it, somehow. The story could have been interesting, but it dragged painfully and the writing was not beautiful so you didn't just enjoy reading for the sake of reading great prose. I could tell the author thought that's what she was doing the way she would end chapters with these sentences that were meant to be devastating in their simplicity but no they were just BORING. I think the idea of a novel that tries to bridge a gap between cultures in America is a great one, and I would have loved to actually learn more about the Cuban American culture in Miami, but instead I felt I learned more about what the stereotypes are. I couldn't relate to the main character nor could I understand what anyone in her family was doing, so instead of bringing me into that culture and making me feel what they do, I just continued to feel alienated throughout the book. This is not a good book. Lizet Ramirez is a first generation college student from Miami. Her first year at college coincides with a young boy from Cuba coming to the United States. She is an outcast in her family because of her choice to go away to school. Her guilt at being away from her family, as well as the social and academic challenges she faces at a prestigious school, put a lot of stress on her. You root for her the entire time, and the story is structured as such, that you are constantly afraid that she will be stuck in the same rut as the rest of her family. A great read! A really interesting look at what is really involved when a young person attempts to leave their home - with their parents expectations - and move into what is really a different culture. Lizet is the daughter of Cuban emigrants whose only goal for her is marriage to her high school boy friend and life in the neighborhood. She is a very bright young woman who manages - without her parents knowledge or approval - to gain acceptance to a very selective college in New York. Unprepared for the cultural difference and with no family support, she has a difficult time adjusting and then discovers that she no longer fits into her family when she tries to return. It is a look at the price you sometimes have to pay to become who you want to be. Not a bad book but rather tedious and boring at times. I thought the issues faced by family to be real, but didn't care much for the characters. Tenía grandes expectativas centradas en este libro: admiro profundamente a los escritores cubanos en Cuba y aún más a los exiliados, retratan con humor, amor, amargura, realismo, poesía, desencanto, con un profundo sentido crítico, la realidad difícil de un país que concibió un gran sueño, una gran utopía, que muy rápidamente devino en pesadilla, escritores de la talla de Eliseo Diego, Jesús Díaz, Daína Chaviano, Leonardo Padura, Guillermo Cabrera Infante, Zoé Valdés, por mencionar solo los primeros que vienen a mi memoria. De allí que, cuando vi entusiastas recomendaciones sobre el nuevo libro de una escritora "cubano-americana", i.e. hija de cubanos nacida en Hialeah, Florida, USA, esperé ansiosamente su publicación. No es que el libro sea malo, no es lo que esperaba, pero debo confesar que la culpa es toda mía, porque muy probablemente represente a esas nuevas generaciones de hijos de cubanos, nacidos en los Estados Unidos, con experiencias más cercanas a cualquier inmigrante latinoamericano que a los familiares que permanecieron en la Isla, al menos en lo que sus expectativas y sueños se refiere. En particular, me resultó particularmente ajena, como mujer venezolana, que el sueño de las adolescentes cubano-americanas sea "atrapar a un buen marido", sin ninguna aspiración de estudiar, trabajar, hasta diría de formar parte del american dream, concentrados en su barrio cubano-americano, que habla español y mantiene las costumbre cubanas.Desde mi punto de vista, lo más interesante del libro es el choque cultural que enfrenta la protagonista cuando sale de Hialeah a estudiar a Rawlings, una prestigiosa universidad, y, por primera vez en su vida, se encuentra inmersa en la cultura norteamericana, y necesita estudiarla para entenderla; la ceguera de la madre en aceptar el mérito que supone que sea la primera en su familia, la primera en su barrio, en lograr tan meritoria distinción, ser aceptada en una universidad de primera línea. El evento central del libro, sin embargo, es la reacción del pueblo cubano de Hialeah ante la llegada del balserito Ariel, que evidentemente es un tibio disfraz de Elián González, aquel niño que fue el centro de las noticias hace unos 15 años, por la infructuosa batalla campal para que se quedara en Estados Unidos. Y aquí abundan los elementos que no terminaron de convencerme del libro; por ejemplo, la protagonista se queja que sus compañeros de estudios de Rawlings no entiendan que una madre esté dispuesta a dar su vida y arriesgar la de su hijo para escapar de Cuba, en busca de mejores condiciones de vida, pero en ningún momento se explica o plantea en el libro las precarias condiciones de vida en la isla, la represión de la disidencia o la inexistencia de espacios democráticos, es una especie de dogma o auto de fé por parte de los hijos de inmigrantes, que todo el mundo debe compartir y conocer "porque sí".Al final, la única salida de la protagonista es aceptar su "transculturación", abandonar quien fue hasta ese momento, su "cubanidad", para poder explorar otro estilo de vida, más americano, en palabras de Jennine Capo Crucet:"...and there was nothing left for me to do except for what I did: I walked away, back to where I’d come from, grabbed my bag, then left that house and eventually that city, kept leaving, year after year, until where I was from became, each time, the last place I left, until home meant an address, until home meant only as much as my memory of that morning would betray. "Un libro ligero para conocer las desventuras de una joven cubano-americana en la actualidad. I think any work of fiction has the potential to touch someone, to impact them, regardless of content. However, those books where you see your own experience mirrored in characters’ lives tend to mean more. They validate you, make you feel less alone. For me, Make Your Home Among Strangers was one such book. The story of its protagonist, Lizet, was one I could easily identify with, one that made me nod my head and think “I’ve totally felt that!” at almost every page. So, in this way, it’s special.There are not, at least as far as I know, many books about first-generation Latino college students, and Jennine Capó Crucet has talked about how she wrote this book with that specific audience in mind. So, for me, a first generation Latina college student, reading Make Your Home Among Strangers was this process of understanding that others felt the way I have over the past few years and recognizing similar experiences, while also appreciating the differences between my life and Lizet’s—there is no universal Latina reality.Which is not to say that Make Your Home Among Strangers was only a book about Latinas in college, or that only Latinos who’ve gone to college should read it—I imagine that anyone might read this book and gain something from it, regardless of ethnicity or situation. However, for me, the sense of recognition and belonging I felt while reading this book were what stood out, what made me stop and think.I think of that moment, freshman year, when my White roommate would make offhand comments about Mexicans that she didn’t intend to be offensive, but only served to make me feel more alienated in an already uncomfortable environment. I think about all the comments about “affirmative action” I’ve received from fellow students when I reveal that I attend college on a full-tuition scholarship for Hispanic merit recognition. I think about the complete befuddlement and lostness that I felt (and sometimes still feel) when attempting to navigate the complex world of college—sure, there’s the office of academic success and intercultural affairs, which exists to help students like me, but the last thing I want to do is admit that I’m in over my head.For all these reasons, Lizet’s story resonated with me. I’m not Cuban and I certainly can’t speak to those specific themes in the book, but she and I have much more in common than is typical when I read a work of fiction. This is, again, why books written by marginalized authors, about marginalized characters, are so important. Recognizing yourself in a book is more validating than one might think, and that’s what made Make Your Home Among Strangers so important to me. "Make Your Home Among Strangers" follows Lizet Ramirez, a young Cuban-American woman leaving her home in Miami for the elite campus of Rawlings College. As the first in her family to attend college, Lizet faces the challenge of trading in her family and heritage for an academic world that leaves her both confused and isolated in her freshman year. Add on to that the tumultuous arrival of Ariel Hernandez (think Elian Gonzalez circa 2000) in Miami and her mother's obsession with his case, and Lizet begins to feel torn between two places. I really enjoyed this book. I felt like Capo Crucet perfectly captured the lost and bewildered perspective of an outsider in Lizet's experiences at Rawlings. The book is split between the college's New York setting and that of Miami, and I would say the college chapters were my favorite because they so sharply captured the ideas of culture shock, isolation, and finding your own way in the world. The Miami chapters, however, offered a fantastic contrast as they served to show all the things that could keep Lizet from really moving forward: family that needs you and doesn't understand your goals, high school boyfriends, and the alluring comfort of the home you've always known. At times I found myself super frustrated with Lizet and her choices, but that made the book all the more real in the end. Through it all, I was really rooting for her. Capo Crucet is fantastic at creating deep and real characters and scenes, I never felt bounced out of the narrative. I felt like this book was the perfect mix of a novel that really has something to say about America and the human experience, but still keeps you riveted by the sheer power of its story. Excellent read for me. As a Latina who attended a highly regarded university, I am able to relate to this story of a young Cuban-American who leaves her Florida home for a college education at an elite institution in upper state New York. She is torn about her decision, feels she doesn't deserve a college education, that she is separating from her family by choosing to move away. Her sense of alienation within a white student population is very real and intricately described.There is so much I admire about this book: the humor, the depiction of campus life, the examination of the slow erosion of cultural identity. But I wish the mother was fleshed out more so that I could have a better understanding of her motivations. I dislike some of the cultural stereotyping (white people can't dance and Latinos are loud and passionate), but the book is written with so much humor that I couldn't help laughing at some of the generalities. One final beef: I really don't care for a style of writing that seems to be more common now: the lack of quotation marks to denote dialogue. It's confusing and makes the reading experience clunky.This is at times a heartbreaking story but a joyful one too. Oh, this book! Jennine Capo Crucet has written a beautiful, terrible, moving story that will keep me thinking for a long time to come about how difficult it is to go home and how one really defines home in the first place. This book. You guys. Go read this book. If I were to put this book on a "genre" bookshelf, I think I'd stick it first and foremost on a coming-of-age shelf. After all, the protagonist and narrator Lizet is on a mission to find her "true" self as she leaves her urban working-class Cuban home in Miami and ventures north to Rawlings College in New York. There, she experiences the culture shock of lots of white people and a school that expects her to be better academically prepared than she is.However, this is more than a "freshman at college" story. It's also about class differences (e.g., Lizet is ultra-aware of the impression her brand-name mittens give off . . . mittens she was given by her roommate) and cultural differences (her sister at home tells her to "stop talking so white," while her friends at college find it outrageous that she hasn't seen XYZ movies). It's about the battle of putting family vs. self first--is Lizet bound to go home and help her sister raise her sister's fatherless son and try to protect her mother from joining what amounts to a borderline activist cult, or should she stay at school and battle charges of plagiarism, a term she only just learned upon failing her "plagiarized" essay?In some senses, these are issues that we all as freshmen faced: how to navigate the world of semi-adulthood while sorting out budding romances and trying to figure out what we actually like to do vs. what we've always been told to do. Yet, for those of us who are White and Privileged, Crucet's novel gives a glimpse into the minority experience that we might conceptually understand but never truly feel empathy for because we have never experienced it ourselves. For that, I applaud this novel and would recommend it to anyone. It's certainly no work of Beautiful Prose or High Literature, but it entertains and it educates, and what more can you ask of a novel? Raised in the Cuban-centric area of Miami, Lizet, the daughter of Cuban immigrant parents, is accepted into Rawlings, an elite Northern college. Once she is there, she struggles to fit in both academically and socially. She chafes at her classmates pigeon-holing her as the "Cuban" girl and is jealous of their wealthy, carefree lives. Meanwhile, back in Miami, her family is falling apart. When Lizet left for college, her father abandoned the family and sold their house. Her mother and single-parent sister and baby are forced to move into a less-desirable house. When Lizet returns home on a college break, she has a hard time fitting back in. Her sister resents her leaving, particularly since their mother has become obsessed over the plight of Ariel Hernandez, a Cuban child whose mother drowned when the raft they were using sank. This story parallels the real story of Elian Gonzales, and the book is set in the same time period (1999-2000).This story is a coming-of-age story about discovering who you are and pursuing your dreams. I felt that some of the characters, particularly Lizet's mother Lourdes, were not very well-developed, and it was impossible to determine the motivation for some of their actions. Some of the foul language seemed a bit gratuitous, at times. Still, the book kept me interested. 3.5 stars. I really liked this book. It spoke to me as an immigrant and as an educator. The voice of the narrator is so strong and we need to hear more of these voices in literature. Remember Elián González, found on Thanksgiving Day clinging to an inner tube three miles off the coast of Florida? His mother and eleven others on the raft had drowned in their attempt to come to the U.S. from Cuba. Make Your Home Among Strangers is about a Cuban-American family entangled in a fictionalized account of the González affair. Elián is renamed Ariel in this book. The main character is Lizet Ramirez who lives in Miami’s Little Havana. In this book, her parents have split, her sister becomes a single mother (in the failed hope that the father will marry her) and Lizet leaves for college in New York. Lizet’s mother, Lourdes, becomes passionately involved in the movement to keep Ariel in the United States. At the same time, Lizet struggles at college. While Lourdes obsesses over Ariel, she ignores her daughter Lizet’s efforts to stay in school. Lizet’s mother’s preoccupation with Ariel becomes a bit unreal in this book. I enjoyed reading about Lizet’s efforts to be the first person in her family to enter college but I struggled with the many pages of the book set in Miami where her mother obsessed over Ariel. Lukewarm 3 stars. This novel is about Lizbet, the first in her Cuban-American family to go to college. Leaving behind her just-divorced parents, older sister Leidy - single parent of a new baby, and boyfriend Omar, she leaves southern Florida to enroll at the fictional liberal arts Rawlings College in New York. There are two main themes: Lizbet’s struggles to adapt culturally and academically, and her mother Lourdes’s obsession with the case of a young boy brought to Florida against his father’s wishes after his mother dies on a raft while fleeing Cuba (think back to Elian Gonzales). Overall, I enjoyed reading about Lizbet’s college experiences. But the reader doesn’t know Lourdes well enough to be invested in her or sympathetic to her over-the-top behavior. All the characters are quite self-absorbed and take themselves very seriously; the book was almost completely lacking in humor. I'm cheating because I stopped about mid way, but I am finished with it. I feel badly that I did not enjoy the book as much I desperately wanted to. Crucet is such a good writer but at times I felt like I was reading a draft in a writer's workshop where the assignment was "Spend 30 Minutes Describing a Chair" or something of that sort. There's just tooo much detail in places, almost as though she doesn't trust the reader. But when the book is good, it is GREAT, especially the sections set at Rawlings University. Crucet captures isolation, imposter syndrome and the pride of a first-gen student. There appeared to be a love triangle brewing and I don't know how it turned out but I did feel affection for both young men, who were very different from one another but equally charming. The cover is what drew me to this book and I'm really glad I requested it. With one of the best opening pages I've read in a very long time, Crucet is a welcomed breath of fresh air on the literary scene. Exploring the experiences of minorities in Ivy Leagues, and expanding on the idea of never being able to go home again, MAKE YOUR HOME AMONG STRANGERS follows Lizet as she balances the line between who she was in Miami and who she is at college. With no family support, Lizet struggles greatly with fitting in somewhere that she is so different than the rest of her peers. So much of what Lizet struggled with, and how she felt, resonated so deeply with me. This is a book I'll be going back to for years to come. I can't even begin to explain how important this book is, both to me and in general. I enjoyed this book. It felt like I was reading my own minority, first generation college student story. The author tells the story of a minority student going to a prestige predominately white college and the challenges that ensue. Also, there is another second story line of the main character's family at home in Miami. The author fictionalizes real life events that occur in Miami during the time period of the novel but anyone familiar with national news will be able to guess quickly about the real life happenings. This is an excellent debut novel!